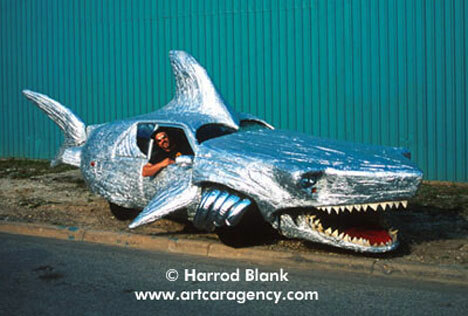 If you passed one of these awesome art cars in traffic, you might just run yourself off the road trying to get a second look. 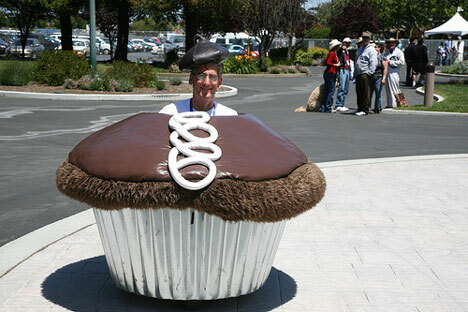 Art cars have long been a popular way for enthusiasts to show off their creative ingenuity. ‘Cartists’ , as they are sometimes called, are usually ordinary people with no artistic training, though some are metalworkers or sculptors. 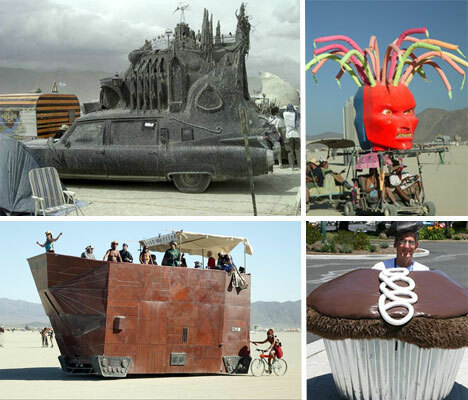 Here are 20 amazing art cars, from Gothic cathedrals on wheels to a van covered in practically every type of camera imaginable. William T. Burge gets a lot of strange looks driving his creations on the highway, and it’s no wonder they don’t look like anything you’ve ever seen before. 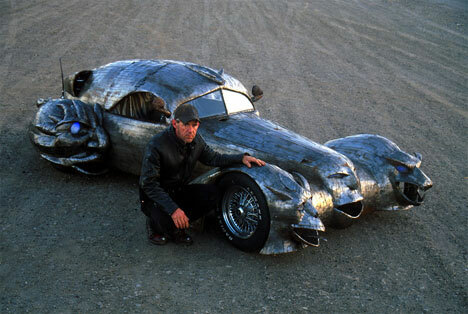 Mark, a sculptor, created “The Phantom”, pictured above, and ˜The Lizard”, both of which have been seen at Burning Man on various occasions, as have many of the other art cars on this list. The Dream Car could have come flying straight out of a 1960’s B-movie involving scantily clad aliens in platform silver boots, but it is actually higher-tech than it looks. 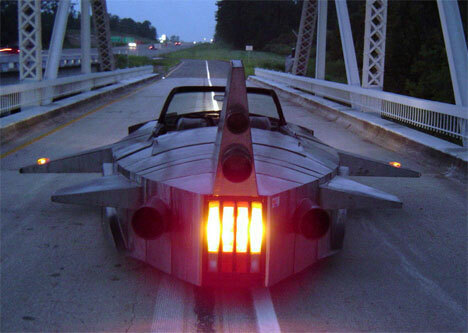 Created by inventor Greg Zanis, it runs on 80 batteries, has four engines and can reportedly reach speeds of 45mph. It can run for 200 miles on a single charge, and it takes about four hours to charge the batteries. 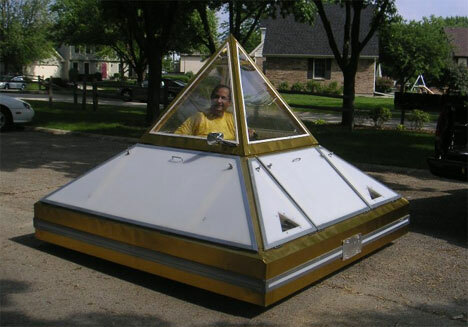 Zanis actually created a special ‘solar and wind tower’ that charges the car using renewable energy. 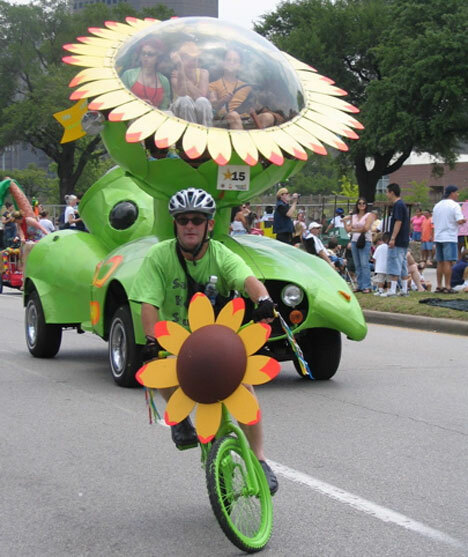 This creative art car was put together by Houston theater group Opera to Go!, and won first place at the 2008 Annual Houston Art Car Parade. The Opera to Go! 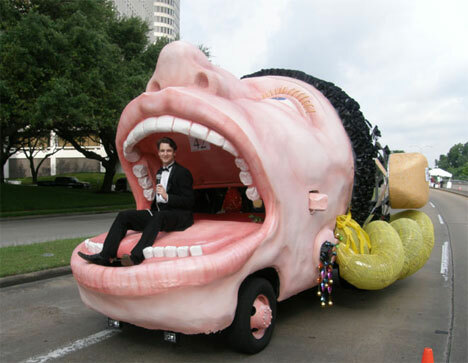 Car featured an opera singer sitting inside the mouth of an enormous sculpted woman. The car underneath is barely visible, recognizable only by the tires peeking out underneath and the side mirrors protruding from the cheeks. 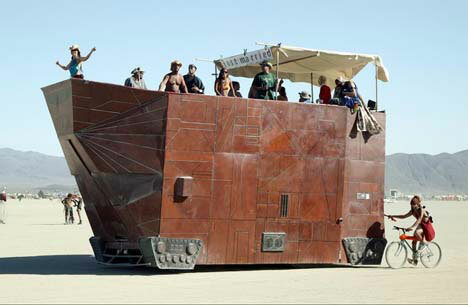 The Jawa Sandcrawler art car was created by J.P. and Dave of Gigsville, a somewhat organized group of Burning Man theme camps based in Southern California. For those unfamiliar, it resembles the vehicles the Jawas drove on the planet of Tatooine in Star Wars. 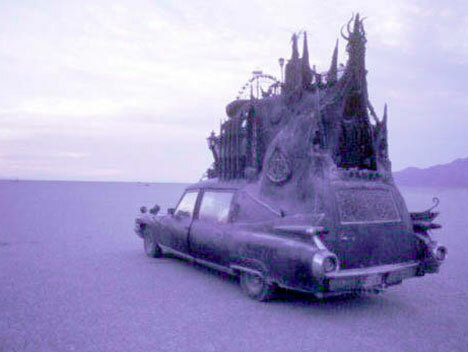 Perhaps one of the geekiest art cars ever, it was said to be the hit of Burning Man 2006. 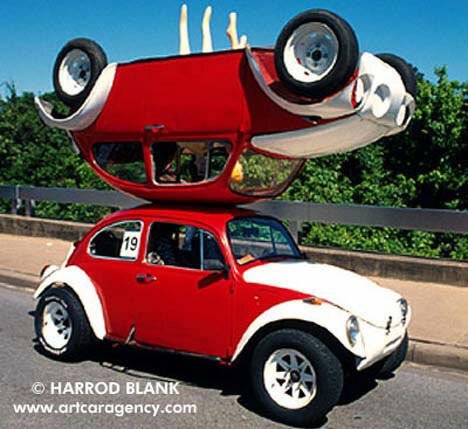 Dennis Clay‘s career as a technical director for a puppet theatre doesn’t seem as though it would lend itself to metal sculpture, but undoubtedly he has a creative streak that influenced the playfulness of this piece in which two VW Beetles were attached roof-to-roof. You might expect some weight and balance issues with such a creation, but the Mirror Image art car runs fine and has appeared in many art car shows. 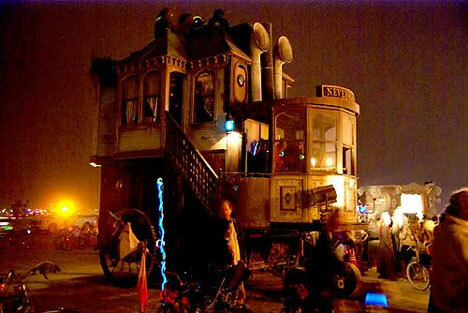 The Neverwas Haul is a self-propelled 3-story Victorian house and was constructed of 75% recycled materials. It is built on the base of a fifth wheel travel trailer, and measures 24 feet long by 24 feet high and 12 feet wide. The creators of the Neverwas Haul are a group of self-described tinkerers, fabricators and artists who are compelled by the desire to portray a Jules Verne-style world in which steam technology is considered cutting edge. Wood sculptor Isaac Cohen built Splinter and Little Splinter over thousands of painstaking hours of shaping, sanding and waxing pieces of wood. 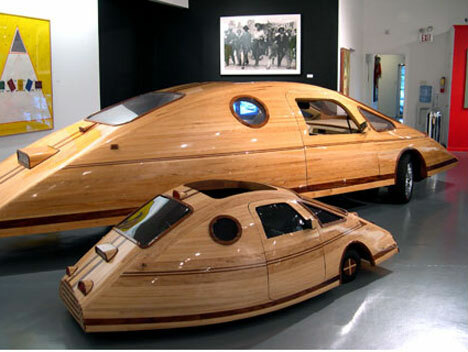 The unusual shape of these two art cars resembles upside-down boats, evidence of the fact that curved wood is Isaac’s specialty. Harrod Blank, a photographer who has taken the photos of several of the cars on this list, has a very appropriate art car of his own: the Camera Van. 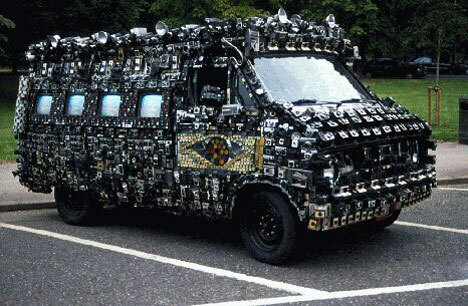 Covered in hundreds of cameras of various types and sizes, the Camera Van was conceived in 1993 when Harrod had a dream about covering his car with cameras and driving around taking photos of people on the streets. The van’s front grill features every type of Polaroid camera ever made, and four fully-functional 32 color monitors on the passenger side broadcast the closed-circuit image of what the van’s working video and still cameras capture. 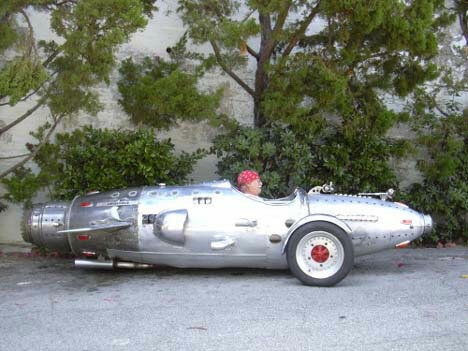 The Sunflower Car started with the kind of vision that only a truly skilled sculptor would be brave enough to take on. Sculptor and co-founder of Sacred Heart Studio Tim Young’s welding skills were gained through years of working in the awning, skylight and ship building industries. 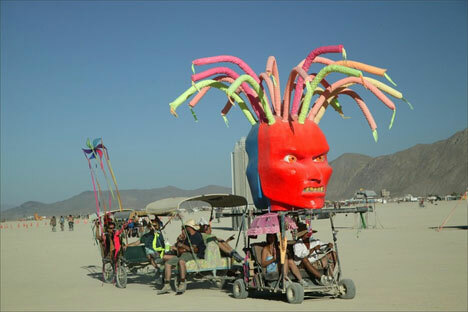 This two-faced evil art car appeared at Burning Man 2006, and seems to be made up of three golf carts strung together along with a giant sculptural head, foam tentacle-like hair and a bobbing whirligig tail. 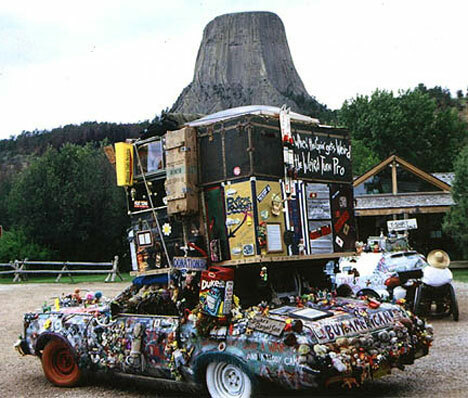 Gonzo writer Rick McKinney has created one of the wildest art cars ever, with thousands of random objects attached to the body of the vehicle seemingly without rhyme or reason. If you take a close look you’ll see baby dolls, plastic fruit, typewriter keys, antlers, animal bones, circuit boards, graffiti (including an autograph by Weird Al Yankovich) and many other objects adorning The Duke, which has traveled many miles across the country. It looks like a crazed carnival on wheels, and it all started with a 1976 Ford Granada. The top part of the car is a actually a loft bedroom comprised of the exteriors of 23 old travel trunks bound together with steel rebar, spray foam and silicone. 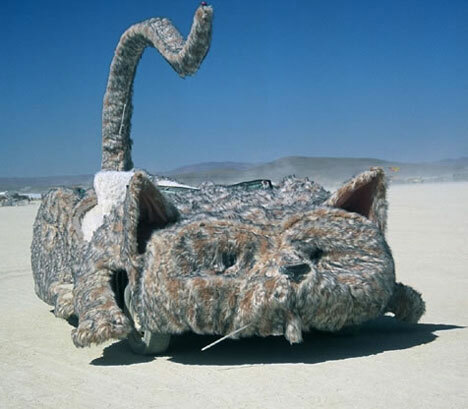 Marian Goodell, aka Maid Marian, built the Cat Car in 2005 for Burning Man. It is entirely covered in faux fur, with a bent tail that towers over the body. No word on what sort of vehicle is hiding underneath that mottled coat. The California Fantasy Van is a 1975 GMC Panel Van and was embellished within an inch of its life by Ernie Steingold, a vacuum cleaner repairman. 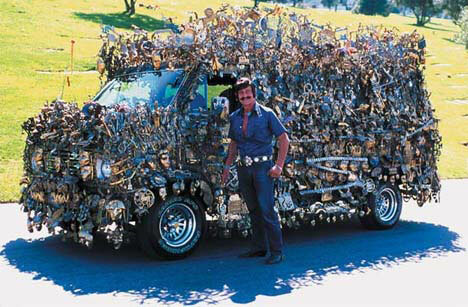 Ernie spent more than 10 years covering the Fantasy Van with 5,000 brass objects and coins. It iss now on display at the Peterson Automotive Museum in Los Angeles. 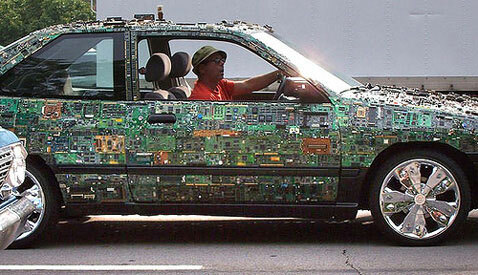 It is an art car to make the nerdcore set proud: a vehicle completely covered in circuit boards. This takes geek art to a whole new level. This was snapped in traffic by Avi Abrams, so the actual owner is unknown. The Phone Car was welded by Dave Huntress and is proudly driven by Howard Davis, the owner of Datel. It was created from aluminum sheets, welded together and formed to provide a molded plastic look. The black face plate of the phone car is tempered glass, which allows the driver to see out. It can go up to 50mph, and was originally built in 1983 as part of a trade show exhibit. 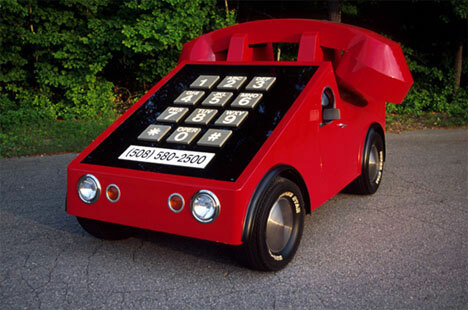 And yes, there is indeed a car phone in the phone car.